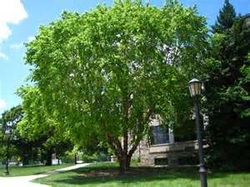 The River Birch tree is a very handsome tree for estates, parks, golf courses and any other large areas. It displays a light reddish brown cinnamon bark that peels and flakes to give that beautiful look that the birch family is noted for. Plant as a specimen, or a windbreak. Plant 20’ apart in the row. It is excellent in wet soil and likes to be planted in full sun to lite shade. The River Birch has dark green summer foliage and turns a golden yellow in the fall. It is resistant to the bronze birch borer. It is a native with graceful branching. This tree can withstand extended periods of flooding. The River Birch trees are beautiful in the summer and winter, are widely adaptable, and heat tolerant.